In what may bring a little relief to lakhs of people in the Capital, Urban Development Minister Jaipal Reddy today indicated that the Government was considering taking a lenient view towards minor violations of building laws in Delhi. Getting tough towards government as well as private bodies defaulting on account of payment of house tax, the Municipal Corporation of Delhi today decided to send notices to the Delhi Development Authority and the Rail Corporation for non-payment of their huge house tax arrears. Activists of the Delhi unit of the BJP will gherao the Chief Minister, Ms Sheila Dikshit, at her residence tomorrow to pressurise her to put a stop to the demolition drive being carried out by the Municipal Corporation of Delhi. Expressing concern over the rampant theft of electricity in the Capital, Chief Minister Ms Sheila Dikshit today called for a change in the prevailing mindset in Delhi of “using power without having to pay for it” to achieve a self-sustainable power system. The Delhi High Court today issued a notice to the Special Task Force of the Uttar Pradesh police on a contempt petition filed by the Delhi Police for issuing showcause notices to Union Home Secretary and Delhi Police Joint Secretary in Samajwadi Party leader Amar Singh’s phone tapping case. Over 1,500 students from Jamia Millia Islamia took out a march on Monday to register their protest against Denmark and the EU for lowering the dignity of Prophet Muhammad through cartoons on him printed in several European newspapers. 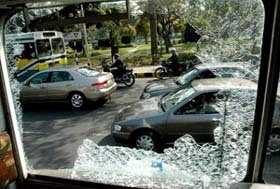 A glass of Delhi Police bus which was broken by rampaging students in the Capital on Monday. The Haryana Government has decided to start Sanskriti School on an experimental basis here. This was stated here yesterday by Ms Aasha Hooda, wife of Chief Minister Bhupinder Singh Hooda. The 15th International Conference on Human Integration was inaugurated by Sant Rajinder Singh Ji Maharaj, President, World Council of Religions, at Kirpal Bagh here. The participants included 290 delegates from 38 countries. There was a sharp fall in the minimum temperature today though the warmth in the air, witnessed all through the last week, persisted, continuing the Capital’s steady march towards summer. A special court today sentenced an MCD Inspector to three years’ rigorous imprisonment for accepting bribe to release goods seized from a transporter during a raid. Special Judge Sunil Gaur found the convict guilty of offences under various sections of the Prevention of Corruption Act and slapped a fine of Rs 10,000 against him. In enforcement raids conducted over the weekend in posh Greater Kailash-l, BRPL Enforcement Teams caught a known restaurant and a guesthouse for power theft. The two were found to have tampered with their respective meters. The Economic Offences Wing of Delhi Police’s Crime Branch has filed a chargesheet in a Delhi court against three top officials of Samsung India, including a former Director and former Vice President for embezzlement of company money to the tune of Rs 19 crore. The Vijay Nagar police, on a court order, registered the kidnapping case of a six-year-old boy five years after the incident. Vijay Nagar Rahul Vihar resident Kailash Chandra’s son Deepu went missing mysteriously 2001. A bride, Godhulika, packed the bridegroom and his parents off to jail when they demanded an Esteem car as dowry on the occasion of marriage on Saturday night here. On Saturday night, bridgegroom Bhavesh, a mechanical engineer, reached the guesthouse on the Delhi road to wed Godhulika. Unidentified assailants killed a watchman here last night. The police did not have any have any clue about the killers’ identity till late this evening. Company manager Kaushal Kishore informed the police that when employees reached the company’s premises at sector 10 this morning they found the security guard lying dead in pool of blood. He, however, made it clear that officials and builders responsible for allowing illegal construction would not be spared. Mr Reddy was talking to newspersons after receiving the new Minister of State for Urban Development, Mr Ajay Maken, who took charge of office today. In reply to a question, Mr Reddy said the government was considering amending the building laws to provide relief to small violators. “I agree that violations whether big or small cannot be allowed. But we as representatives of public have to be cautious about the sense of panic prevailing among lakhs of people in the Capital,” he said. The Urban Development Minister confirmed receipt of a letter from Delhi Chief Minister Ms Sheila Dikshit expressing concern over the large-scale demolitions in Delhi which had sent a wave of panic throughout the city. He said violations of building laws in Delhi fell into various categories and they could not be clubbed together for action. The government was considering a lenient view for minor violators in view of a ‘sense of panic’ among lakhs of residents. The minor violations include construction of an additional bathroom or a study room in houses, including DDA flats, he explained. Mr Maken and Mr Reddy said that they shared the concern expressed by the Delhi Chief Minister and were working out a solution which would come sooner than expected. “I can assure you of a solution earlier than you are expecting,” Mr Maken told a questioner. Asked if the government was planning to issue an ordinance to spare houses having minor violations as suggested by the Chief Minister, Mr Reddy said that it was not possible to issue an ordinance on the eve of Parliament session. But there were other ways to deal with the situation, he added. He categorised violations in four categories —illegal use of government land, illegal conversion of land use from residence into shop, construction of additional rooms or floors and property falling under Lal Dora..
Mr Reddy dismissed the charge that MCD’s demolition drive had lost steam in the past few days following protests by ‘big fish’, like owners of malls. He said everything was being monitored by the High Court. Besides, the ministry had nothing to do with the demolition operation, he added. He did not agree with a suggestion either that the government could follow in Delhi the Ulhasnagar (Maharashtra) example in dealing with the illegal constructions. “I don’t think that the problems are the same,” he clarified. Maintaining that the ministry would take into account all factors while finding a solution to the problem of “illegal constructions” in Delhi, he said it had come up in decades and a solution could not be found overnight. “But I can assure you that whatever be the solution, it will be long lasting,” he said. Meanwhile, the trendy shopping malls in Delhi’s upmarket MG Road Lal Dora area continued to crumble under MCD bulldozers as the civic body resumed its demolition drive against unauthorised constructions across the national capital today. MCD officials, armed with huge cranes and bulldozers, tore through 2, MG shopping mall in the area which houses some of the best known brands of the Indian fashion industry even as the Delhi High Court declined to grant any interim relief to the affected people. The civic body pulled down outlets in the ground floor of the multi-storeyed structure on orders from the High Court to demolish illegal structures in the area, which were earlier considered to be out of the purview of building bye-laws. The MCD had earlier pulled down parts of 1, MG shopping mall amidst protest by high-profile fashion designers, shop owners and employees. The corporation resumed its drive after the Sunday break and also demolished 23 unauthorised residential and commercial constructions in all the 12 zones. It took action against 12 residential properties and 11 commercial properties and removed over 11,000 square feet of encroachment from government land in New Rohtak road and Meenakshi Garden areas, While four illegal residential structures were fully demolished, eight residential and nine commercial constructions were partly razed. Two commercial properties were also seized. Getting tough towards government as well as private bodies defaulting on account of payment of house tax, the Municipal Corporation of Delhi today decided to send notices to the Delhi Development Authority and the Rail Corporation (DMRC) for non-payment of their huge house tax arrears. A meeting of the MCD Standing Committee saw members adopting a tough posture on DMRC non-payment of its Rs 450 crore house tax arrears and urged Chairman Mukesh Goyal to direct the administration to promptly send notices of repayment to the organisation. Till now, the MCD administration has been dithering on the issue of sending a notice to the DMRC on the plea that it had been decided in a meeting with the Chief Secretary that the Delhi Finance Corporation would offset the loss of property tax liability to be paid by the DMRC. The committee also decided to send notices to the DDA against whom tax arrears of Rs 203 crore are pending but which has been denying its liability for payment of house tax on the plea that it is a 100 per cent government-owned entity. In an action taken report submitted before the house, it was informed that the list of government and private bodies having huge house tax arrears against them include the Delhi Jal Board (Rs 312 crore), the NDPL (Rs 265 crore), the BSES (Rs 6.25 crore), Transco (Rs 22 crore), CPWD (Rs 4 crore), PWD (Rs 3 crore), Delhi Police (Rs 2.21 crore), Delhi University (Rs 15 cr), Jawaharlal Nehru University (Rs 10 cr), the Sports Authority of India (Rs 1.5 cr) and the India Habitat Centre (Rs 50 lakh). As part of its efforts towards recovery of house tax arrears against these organisations, the bank accounts of the Delhi University, Transco and the NDPL have already been attached by the Corporation. Though the NDPL and the BSES managed to obtain a court stay on the attaching of its accounts, legal efforts are on by the MCD to get the stay vacated. Of the rest, out-of-court settlement has been reached with many like the DJB, IHC, BHEL, SAI and the CPWD all of whom had agreed to pay their arrears before March 31, while notices have been send to others for repayment. Under the recovery efforts, the MCD has been putting up the names of its house tax defaulters at notice boards in several areas of the capital while the names of many has been publicised through the public address system. Newspaper advertisements have also been issued to urge the defaulters to pay up their pending tax. President of the Delhi BJP, Dr Harsh Vardhan said that instead of regularising the colonies, the Congress-ruled Delhi Government was demolishing the “so-called” unauthorised constructions in the national Capital. Demolishing these structures is immoral. The government should introduce an ordinance for protecting the houses and providing permanent accommodation to those who do not have their own houses, he said. The Congress, which in power in MCD, Delhi Government as well as in Centre, is not serious about safeguarding the houses of the residents of Delhi, he added. While addressing a conference, Dr Harsh Vardhan demanded that the Central government constitute a high-level empowered committee immediately to regularise all the illegal constructions done so far. Fifty per cent members of the committee should be from the opposition parties. The committee should make its recommendations within 30 days for regularising the illegal constructions and changing the land use, he said. The amnesty plan recommended by the V.K. Malhotra Committee should be implemented soon. The building bylaws of 1954 should be abolished and the Master Plan of 2021 should be implemented. All 1600 unauthorised colonies should be declared regularised. In view of the housing needs of the people, all the dwelling units should be allowed to construct up to third floor. The need of compulsory approval of plan for building houses on the plots up to 100 square metre should be abolished, he said. As far as the JJ clusters are concerned, the government should make alternative arrangements before demolishing such structures. Interestingly, cracks appeared in the Delhi BJP over the demolition of illegal structures here as a former minister, backed by party veteran Madan Lal Khurana, offered to quit as legislator, accusing the state BJP leadership of complete inaction over the court-ordered MCD drive. Delhi’s former Industry Minister H S Balli told a news conference here that Delhi BJP chief Harsh Vardhan had “misbehaved” with him over his decision to go on an indefinite hunger strike from tomorrow against the demolitions. He charged the BJP in Delhi with being a “loyalist Opposition” to Chief Minister Sheila Dikshit. A three-time MLA from West Delhi’s Hari Nagar constituency, Balli released the copies of his complaint in this regard to BJP chief Rajnath Singh wherein he accused the party’s Delhi leadership of arbitrariness and inaction. “I am ready to resign both from the party and as an MLA for this struggle against demolitions,” he said, claiming Vardhan had “threatened” to expel him from the party if he went on a hunger strike. Last week, Khurana, readmitted to the BJP’s national executive from where he had been removed last year over his outbursts against the then party chief L K Advani, had announced Balli’s plan to go on hunger strike. Vardhan, however, maintained that the call for hunger strike did not have the sanction of the party. “This hunger strike has absolutely no sanction of the party. In fact, it is something against the party’s advice. Something of this magnitude has to be carried out with permission of the party’s national president,” he pointed out. “The mindset that one can consume water and electricity for free has to change. Today, nobody can afford not to pay for power that one uses if we are to encourage a self-sustainable power system in the capital in the near future,” she said in her inaugural address at a seminar for the ‘Appraisal of power sector reforms in Delhi’. Lamenting that over the years, people in Delhi had got used to a system that encourages a culture of power thefts, the Chief Minister called for the cooperation of the people to reduce such tendencies. On the three and a half years of Power reforms in Delhi wherein the Delhi Vidyut Board was unbundled in July 2002 and three private distribution companies, one transmission company and one generation company set up, Ms Dikshit “all projections made when the Memorandum of Understanding (MOU) was signed with the three companies three years ago have been achieved”. On the widespread perception that power reforms had failed to achieve the desired results, she said “all those who criticise the power reforms ignore the problems at the ground level, the foremost being those of rampant thefts of power and electricity. Nearly 40-50 per cent of the people of Delhi, who are residing in the slums and JJ clusters, are using free water and electricity, which has today contributed to the huge losses in power transmission and distribution”. While lauding the efforts being made by the power distribution and transmission companies in the direction of ensuring a sustainable power system, the Chief Minister called upon them to take more steps to improve interface with the public. Referring in this regard to the protests last year over installation of electronic meters in Delhi, Ms Dikshit said “it is important to make people aware that electronic meters are a necessity. Had the power companies done so, the protests that we saw last year on the issue in Delhi would not have arisen”. In this regard she criticised the use of force in several areas of Delhi to install electronic meters. On the perception that the state government was not doing enough to augment it current level of power production, she said “we are willing to produce our own power but unfortunately we do not have any hydel system to do so and the Centre too has expressed its inability to give us more gas to set up hydel power stations”. Mr Dikshit pointed out that it required at least 5-7 years before any power reform process could achieve concrete results. “In our case, it has been just three years since the power reforms were initiated. To believe that a system that was totally decrepit can get a total makeover in just three years is like expecting the government to possess a magic wand. Still a considerable progress has been achieved,” she said. Earlier, in his keyonote address, the Secretary, Ministry of Power, R V Shahi, voicing his concern over the huge losses plaguing the power sector, said “there needs to be focussed accountability on the part of players who manage generation, distribution and transmission. For one, the slow reduction in losses undergone by the sector is a matter of concern”. Agreeing with the Chief Minister’s view about the need for a change in mindset of the consumers, of using electricity without paying for it, Mr Shahi said “unless the public attitudes change, there will come a stage where there would be no electricity to give”. On the future of power reforms in Delhi, Mr Shahi, giving the example of Orissa, said “ever since power reforms were implemented in Orissa in 1999, the state government has not had to spend anything on the power sector. A similar stage has to be achieved in Delhi, hopefully by 2007-2008 so that the electricity sector runs on its own, without government support or subsidy”. “Removing subsidy will invariably have its pains in form of an increase in tariff. But, the additional revenue generated through increased tariff can be spent for the betterment of society like in case of Andhra Pradesh,” he said. The day-long seminar will have presentations on power reforms by members of the Delhi Electricity Regulatory Commission, BSES, NDPL and the Delhi Transco Ltd. It will also include a presentation on ‘Power Sector Reforms - Issues of Concern’ by the CII. The Delhi High Court today issued a notice to the Special Task Force (STF) of the Uttar Pradesh police on a contempt petition filed by the Delhi Police for issuing showcause notices to Union Home Secretary and Delhi Police Joint Secretary in Samajwadi Party leader Amar Singh’s phone tapping case. Justice R C Jain issued a notice to the STF and asked it to file its reply by February 8, the next date of hearing. Delhi Police Counsel Mukta Gupta alleged that the STF continued to conduct a parallel investigation into the case despite the court’s earlier order restraining the UP Police from its ‘interference’ in the Delhi’s probe. In an order, the High Court had restrained the UP Police from interfering in the investigation by the Delhi Police, while allowing the STF to collect the copies of the documents from the Capital’s police and Reliance Infocomm. After the arguments on January 25, Justice Jain had reserved the order on the quashing of an FIR lodged at Noida by the UP Police in connection with the alleged phone tapping. However, the Judge said the interim order of the court directing the UP Police not to intervene in the investigation of the Delhi Police would stay till the final judgement. Senior Counsel Sushil Kumar, appearing for the Uttar Pradesh Government, had alleged that “the Union Government and the Delhi Police had been tapping the phones of the politicians on the directions of the political masters”. Despite the guidelines of the Supreme Court, the Delhi Police and Union Home Ministry had been allegedly tapping the conversation of the political leaders to pin down them, he had claimed. Ms Gupta, appearing for the Delhi Police, submitted that the FIR had been lodged at Noida to intervene in the investigation carried out by Delhi Police in the case. Mr Kumar said it was altogether a different case and the accused are also not the same persons. So the Delhi Police should co-operate with the UP Police in the probe, he had added. Mr Kumar had alleged that accused Anurag Singh had colluded with Delhi police to prevent the UP police from conducting investigations as they were afraid of the truth being revealed by such a probe. Accused Singh had been illegally tapping the phones of various leaders earlier also on the direction of the Delhi Police, he had alleged. The newly formed Jamia Students’ Union led the march. The marchers headed for the Embassy of Denmark to protest outside the embassy. What began as a peaceful protest, however, failed to stay that way as the marchers were lathi-charged by the police at Janpath. Teargas shells were lobbed at them and chaos broke out. Many protestors were injured badly and taken into custody by the police. Further, Shams Pervez, president of the Jamia Students’ Union and other union leaders have also been arrested by the police. The cartoon controversy over Prophet Muhammad has been raging for the past few months. It began when 12 editorial cartoons, depicting the Prophet in different poses, were brought out by the leading Danish newspaper Jyllands-Posten in September-end. One of the cartoons is especially obnoxious as it depicts Prophet Muhammad carrying a bomb in his turban with a lit fuse and meeting jehadis in heaven. These cartoons were later picked up by the newspapers throughout Europe and printed through November to January. Muslims all over Europe have protested against these cartoons as they imply that all Muslims are terrorists. Side by side, the cartoonists have received death-threats and gone into hiding while newspapers had to increase their security. International reaction has been swift in condemning these cartoons. The foreign ministries of 11 Islamic countries have demanded action by the Danish government. Libya has closed its embassy in Denmark in protest against the government’s refusal to censure the newspaper or apologise. Recently 17 Islamic countries have renewed calls for Denmark punishing those responsible for the cartoons. On February 4, the Danish and Norwegian embassies were set ablaze in Syria. A day later, the Danish Consulate General was burnt down in Beirut. Closer home, a protest march on this issue has been taken out in Srinagar this Monday itself. The strike call was given by the Kashmir bar association and separatists organizations. Shops and businesses have stayed largely shut and there have been fewer vehicles on the roads. The Haryana Government has decided to start Sanskriti School on an experimental basis here. This was stated here yesterday by Ms Aasha Hooda, wife of Chief Minister Bhupinder Singh Hooda. Mrs Hooda, who was here to preside over the closing ceremony of the state-level science exhibition in the SCERT complex, said the government had already allocated a sum of Rs 50 lakh for setting up the school. The foundation stone for the proposed school is expected to be laid on April 1. The conceptual basis for setting up Sanskriti School is to facilitate brilliant students of government schools in the state to take admission there for better education. In effect, it will be like a model school, more or less like Vikas School in the national Capital. Students of 74 schools from all 20 districts in Haryana took part in the three-day exhibition. Mrs Hooda further announced that the government had decided to give a purse of Rs 1,000 to students who had taken part in the science exhibition and presented a model. Also, teachers helping them would be given a purse of Rs 2,000. The government also announced a grant of Rs 20 lakh for the SCERT. Mrs Hooda urged that stress should be laid on women’s education and their empowerment. “Educating a girl uplifts two families in the long run,” she said, emphasising on the virtues of education for girls. Clearly, she was touching on the issue of enhancing the human capital of the state and the country in the era of globalisation by uplifting the educational standard of girls. She said the present government had taken a number of measures and drafted policies to empower women. A seminar on “The Importance of Meditation for a Peaceful World” was held yesterday at Kirpal Bagh here. A vast audience was addressed by Sant Rajinder Singh Ji Maharaj, Dr Maulvi Mufti Mohammed Mukaram Ahmed, Acharya Sadhvi Sadhna, Swami Sudarmanand Ji Maharaj, and Rabi Ezekiel Issac Malekar. Sant Rajinder Singh Ji Maharaj said the purpose of life was to know ourselves and find God within us. “We study and research the environment, the earth and how nature works. We study relationships in the whole cosmos. We, however, live by our senses and believe that their experiences are true. We keep looking outward without looking at the reality of God, The Eternal Beloved, within”. As Sant Darshan Singh Ji Maharaj says, “We are communing with the moon and the stars, but alas! we have not reached the heart of our neighbour”. Death is integrally connected with our body which we have to leave one day. Through meditation, we can easily silence the senses and the mind that doesn’t let us rest also gets calm by the silent mental repetition of God’s name. We are then enabled to connect with the divine and peaceful spiritual regions within. As more and more of us experience this peace, the peace spreads all around. Once we experience the love of God within ourself, we can also experience his presence in others and truly realise the purpose of life on earth. Mata Harbhajan Kaur Ji and Mata Rita Ji sang a hymn, “Guru ki Sewa Safal hai..”, and Sadhvi Sadhna Ji said the sangat was very fortunate to have a Guru who taught meditation. Rabi Issac Malekar said “simran” (meditation) could be done anywhere and at anytime. Swami Sudarmanand commented that people from different religions and faiths were sitting together on one platform because of the underlying spiritual truth “that we can uncover through meditation”. Dr Maulvi Mufti Mohamed Mukakram Ahmed said religion taught us good things and how to pray to Allah so as to see him. In case we could not do that, at least we should be aware that he was seeing us. When he saw humans, he realised the frailties of man and responded to our prayers. The preliminary stage of spirituality was to “Be Good and Do Good”. The ninth free eye operation camp in collaboration with I-Care Hospital, Noida, was also held at the conference with the grace of Sant Rajinder Singh Ji Maharaj in which 734 patients were tested and 373 patients identified for free eye operation. Sant Rajinder Singh Ji Maharaj complimented the organisers, as over 83 per cent of our activities are supported by eyesight and restoring eyesight is a very great service to people. The 16th blood donation camp was also held in collaboration with the Rotary Blood Bank in which 105 persons donated blood. The minimum temperature witnessed a sizeable drop today to 8.8 degrees Celsius, from around 12 degree Celsius on Saturday, but the maximum temperature, continuing its upwards movement, rose to 28.6 degrees Celsius, which is six degrees above normal. In fact, the heat during the day, led the people of Delhi to cast away their woollens and blankets. Met Office attributed the drop in minimum temperature to the decrease in the speed of the South Easterly winds, which had been contributing to a rise in mercury during the nights and early mornings last week. In fact, the minimum temperature recorded a high of around 12 degrees Celsius on Friday and Saturday. Delhi recorded maximum temperatures of around 27 degrees Celsius, four to five degrees above normal, all through the last week. The Met Office has forecast a partly cloudy sky for tomorrow. The minimum temperature was expected to stay at nine degrees Celsius. A special court today sentenced an MCD Inspector to three years’ rigorous imprisonment for accepting bribe to release goods seized from a transporter during a raid. Special Judge Sunil Gaur found the convict guilty of offences under various sections of the Prevention of Corruption Act and slapped a fine of Rs 10,000 against him. The convict, Sohan Lal, an Inspector with the Minto Road branch of the civic body’s Rent Control Department, on February 13, 2002, raided the office of complainant Mahendra Kumar, a transport services owner. During the raid, the team impounded office equipment and other goods present on the premises. When Kumar approached the convict requesting release of the goods, Lal demanded a pay-off of Rs 10,000 to be halved between him and other MCD officials. Lal further dissuaded the complainant from seeking legal help by saying that it would cost him Rs 50,000, including ‘fines’. 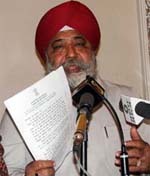 Aggrieved, Kumar filed a complaint with the Anti-Corruption Branch on June 8, 2002, following which Lal was arrested. In enforcement raids conducted over the weekend in posh Greater Kailash-l, BRPL Enforcement Teams caught a known restaurant and a guesthouse for power theft. The two were found to have tampered with their respective meters. Their meters were slow between 67 per cent and 80 per cent. A cumulative penalty of around Rs 1 crore is being levied against them. According to a BSES official, “The restaurant had tampered with its meters by breaking the seals, cutting the ultrasonic welding and breaking open the meter body. In the second case, BRPL Enforcement Teams, nailed an upmarket guesthouse, located at B-167 Greater Kailash, for stealing electricity worth around 90 KW by tampering with the meter by almost 70 per cent. According to a BSES official, “The guesthouse was found to have illegally deployed sophisticated remote control. A penalty of over Rs 30 lakh is being levied. This is the first time that we have detected such a sophisticated device being used to steal electricity, added the official. Metropolitan Magistrate R K Singh today took cognizance of the chargesheet filed against ex-Vice President, Information Technology (Sales) Division Vivek Prakash, former Director J S Jong and company executive Sonal Anand, accusing them of criminal breach of trust, forgery, cheating and criminal conspiracy. A chargesheet against a fourth accused in the case, former Accounts Manager R S Sahu, has already been filed in the court. According to Manoj Taneja, counsel for the Korean multinational, Prakash, in conspiracy with Anand, Jong and Sahu, allegedly defrauded Samsung of several crores of rupees by manipulating and falsifying books of accounts. After his anticipatory bail applications were rejected by the Delhi High Court and the Supreme Court, Prakash was finally arrested on December 8 last year. Co-accused Sahu was arrested on May 20, 2005, while Anand and Jong have not been arrested. According to police, they allegedly issued fake credit notes worth about Rs 16 crore to various distributors to collect the amount from the company. Prakash, an MBA from IIM-Bangalore, and Sahu had developed a parallel accounting system within Samsung, and regularly siphoned off large amounts of money from company accounts, they said. The Vijay Nagar police, on a court order, registered the kidnapping case of a six-year-old boy five years after the incident. Vijay Nagar Rahul Vihar resident Kailash Chandra’s son Deepu went missing mysteriously 2001. A missing person report was lodged at the Vijay Nagar police station. Later, he told the police he suspected his son had been kidnapped. He also gave names of the possible suspects. The police refused to register a kidnapping case. He approached senior police officials of the district but could not get the justice. His son also could not be traced. He approached the Supreme Court which directed the police to register a kidnapping case, search the boy and arrest the accused. The police said both the accused were cousins of the complainant. Raj Kumar is a Delhi Police constable and Ajay Pal is a security guard with a Noida company. The police hope to solve the kidnapping soon. A bride, Godhulika, packed the bridegroom and his parents off to jail when they demanded an Esteem car as dowry on the occasion of marriage on Saturday night here. On Saturday night, bridgegroom Bhavesh, a mechanical engineer, reached the guesthouse on the Delhi road to wed Godhulika. During the Jaimala ceremony he refused to garland the bride till his demand was met. After the bride’s father Mulendra Kumar Mittal agreed to their demand he garlanded the bride. Within minutes, they asked for a guarantor which made the bride furious. She stood up and refused to marry the bridegroom, asking her father to call the police. The Kotwali police, on the bride’s complaint, lodged an FIR and put Bhavesh, his father Jagdish Prasad Aggarwal, sisters Charu and Poonam, brother-in-law Manish, Nitin, friend Rajiv and maternal uncle Mahendra behind bars. Unidentified assailants killed a watchman here last night. The police did not have any have any clue about the killers’ identity till late this evening. Company manager Kaushal Kishore informed the police that when employees reached the company’s premises at sector 10 this morning they found the security guard lying dead in pool of blood. His chest had a stab wound. The police have sent the body for a post-mortem examination and started investigations. Several workers and neighbours have been questioned by the police.